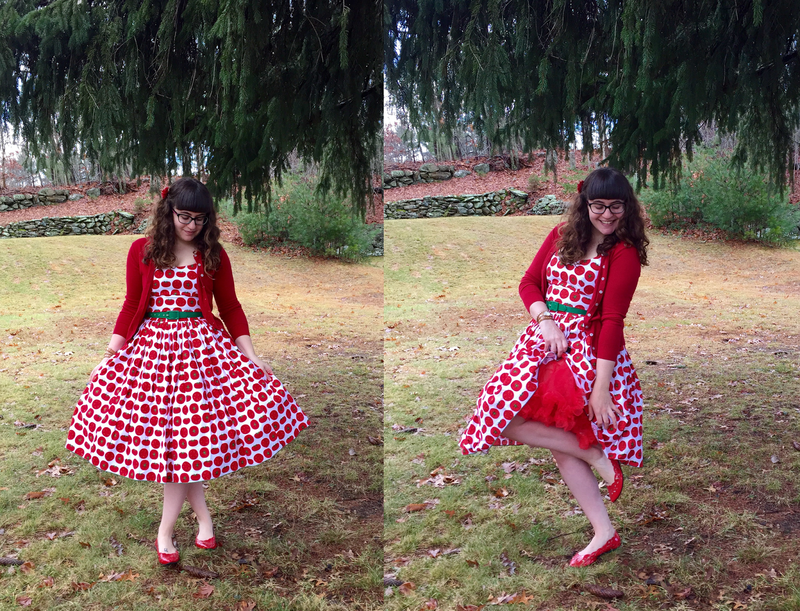 In a Nutshell...: The Most ~Perfetto~ Italian Christmas Dress! 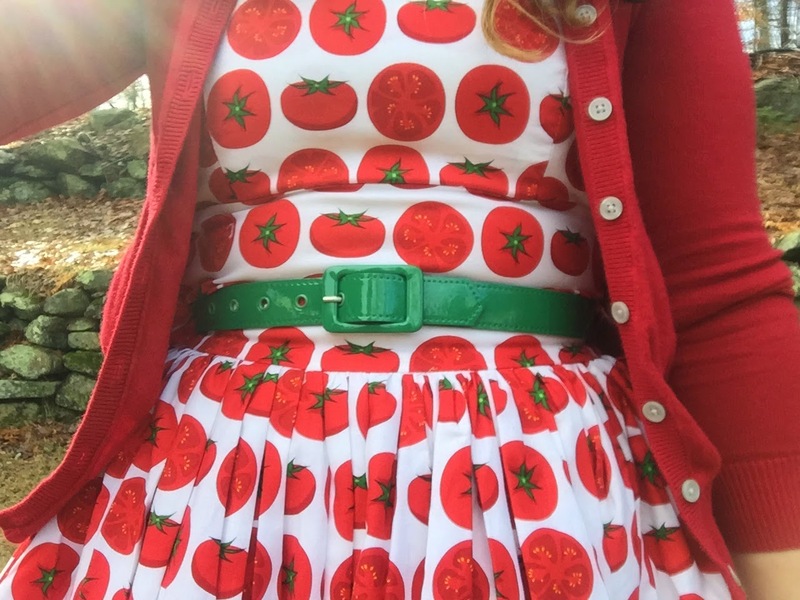 I found and purchased this delicious looking tomato dress from Bernie Dexter during her Black Friday sale. When I spotted it and decided to go for it, I knew I would save it for Christmas. I am half Italian and it truly comes out at Christmas. Growing up, on Christmas Eve my sisters and I would always help my dad make the shrimp, fried fish, and stuffed calamari - getting the nickname Calamari Girls from an early age. We still are his Calamari Girls even though we're not really there to help anymore. He still makes calamari to this day and on Christmas, we have an Italian feast. I winced a little when I realized how much white the dress had (it was just ASKING for sauce to be dropped on it!) but with a cardigan over it, I was able to rest easy. 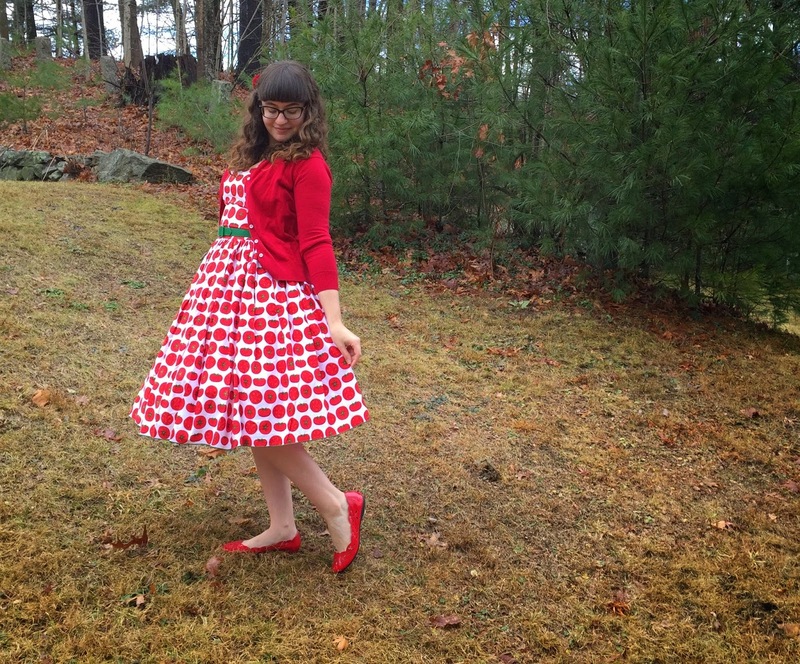 I'd rather mess up my $24 Old Navy cardi than get one teeny tiny spot on my Bernie Dexter! I just love how some of the tomatoes are whole and some are halved. 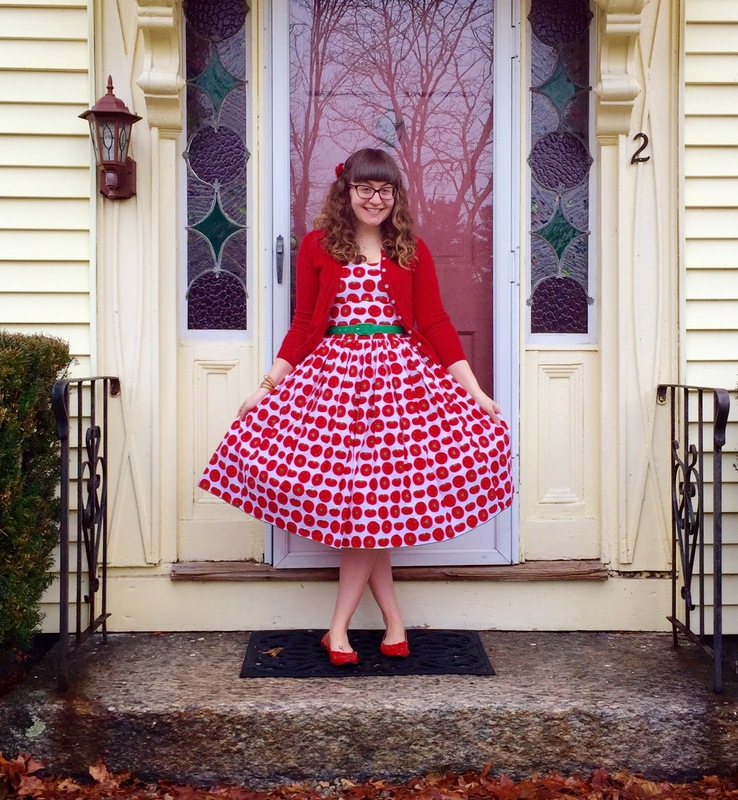 As usual, the detail of this Bernie dress is just too stinkin' adorable! I feel like she always has such awesome detail on her prints. It's one of the reasons why I love her and don't mind spending a bit more money on one of her dresses. Of course, it helps when there's a sale! 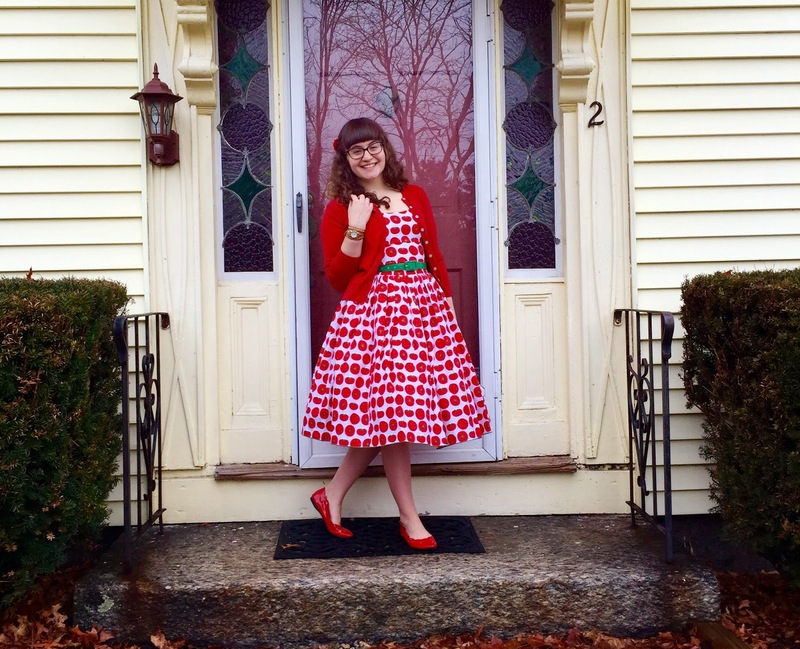 Christmas always smells like homemade tomato sauce in my house so I knew this Bernie dress was it for me! My parents love to make a HUGE pot of homemade tomato sauce on Christmas Day. They throw in the calamari, tons of veggies, meatballs, and sausage. Then, after everyone is done, my mom splits up the sauce and all its goodies into big Gladware containers, labels them, and freezes them. Then my parents have sauce to last them all year! They just take out a container, thaw it out, and they have an instant spaghetti dinner! After dinner, we attack the piles of Italian cookies my family has ordered from our favorite Italian bakeries for years. I can eat a dozen by myself, I think. We always order an assortment of the classic anisette cookies but our favorites are the snowballs and the fruit roll up cookies. We love the fruity ones so much that in recent years, we started ordering an extra batch of cookies made up of JUST the fruity ones! It's so bad but they're SO GOOD! 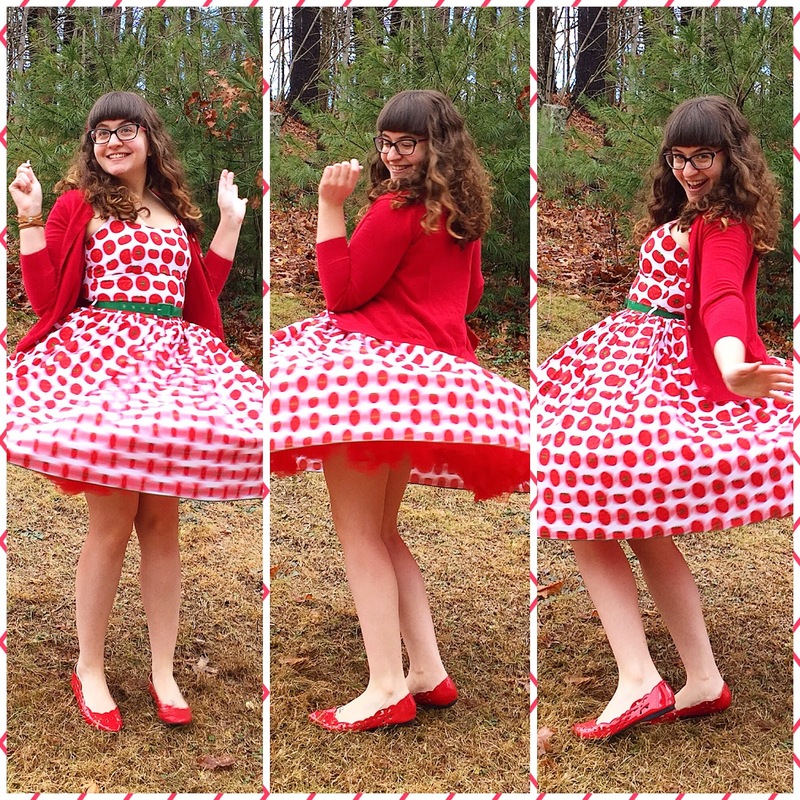 So here's to my big Italian Christmas and my new Italian Christmas dress! What did you do this year for Christmas? 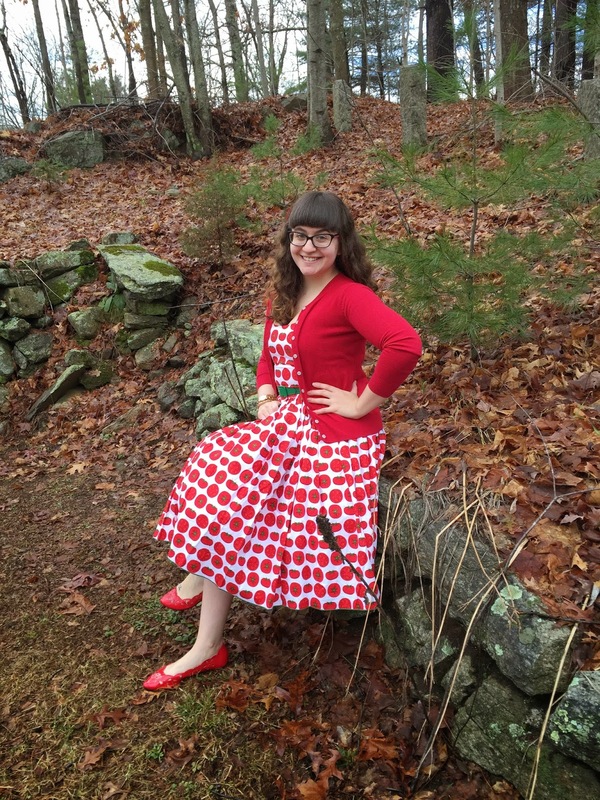 Do you have traditions that carry from year to year? Does your family make a particular meal every year like mine? Are you starting your own with someone new? It's OK to talk about it still. It won't cause a seizure or anything, I promise.